There are some absolutely wonderful places to stay in the Lakes which in the old days we'd have called "Inns." These days they may be called Lake District Pubs, or Pubs with rooms, or they may still maintain the traditional description of Inn, but they all have the same characteristics. They're reasonably priced, you can get great food and beer, and they offer comfortable accommodation that's super value for money. If you want to stay in the Lakes, but you'd prefer a change from a hotel, and you want something a bit livelier than a bed and breakfast, then try one of these recommended pubs with rooms. If you're looking for good food, you can enjoy a meal in our delightful restaurant looking over wonderful panoramic views from the Duddon valley to the sea. Our menu is well prepared with a large proportion of locally sourced produce. The traditionally-styled bar attracts a friendly crowd and the open fire adds to its warmth and atmosphere. We have several guest rooms, most having en-suite facilities; all are very comfortable with TV and tea and coffee making facilities, and full English breakfast. The function room and beer gardens offer an attractive location for the smaller, more personal wedding reception. The High Cross Inn sits beside the main road along the west coast. Just a short walk and you’ll be in the picturesque and vibrant little town of Broughton-in-Furness, the whole area being great for a quieter stay in the Lake District, or for exploring the Furness Peninsular and Western Lake District, and especially walking the western fells. The Eagle and Child Inn is one of those old world village pubs which sadly seem to have gone out of fashion. If the weather is warm you can enjoy a pint by the surging waters of the River Kent in the comfortable beer garden. If it's too cold to sit outside, you can enjoy the comfort of the bar, complete with a log fire. The pub fare is delightful, and there's a wide variety of menus to suit all tastes. While the wine list is good, the speciality of the house is real ales, with guest beers selected by our host Richard appearing on a regular basis. The accommodation is of the highest standard, the decor tasteful and unfussy, and all rooms afford views of the surrounding scenery. An excellent location either for a brief stopover or a longer stay. 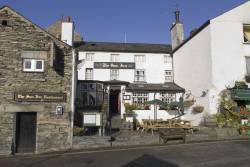 The Sun Inn situated in the heart of the picturesque village of Hawkshead is a warm, friendly and traditional Lakeland Inn. Recently refurbished the bedrooms are outstanding. With superb en-suite facilities and sympathetically designed rooms making the most of the wealth of character that you would expect of a 15th Century Inn. A hearty English menu of predominantly local produce is complemented by local beers and friendly service from the Woolf sisters who run the pub, and whose family have resided in the village for 7 generations. Wonderful walks, fishing, and mountain biking are all on the doorstep as well considerable shopping opportunities in the village. 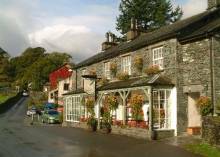 Surrounding areas include, Windermere, Sawrey, home of Beatrix Potter, Brantwood and Coniston Water. Wordsworth’s school is next door to the Sun Inn. There’s so much to do from such a comfortable and friendly base one visit won’t be enough. The Kings Arms has been around since the 16th century, serving real ale to locals and visitors alike. Those old oak beams are real, not modern fashion accessories. This village pub still carries on the time-honoured tradition of good company in the public bar in traditional surroundings. The beer, naturally, is real ale and the food is delightfully prepared and serviced from local produce. There's a wide variety on the menu with a daily special. The accommodation is of the highest standard yet it's been installed without sacrificing the antique charm of this venerable establishment. If all the rooms are booked, you might be able to rent one of the owner's charming country cottages. 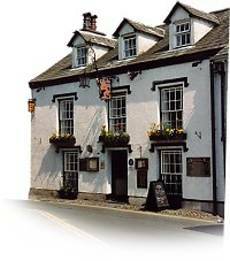 The Kings Arms is a traditional 15th century Inn, attractively situated in the centre of Hawkshead and serving fine ales and superb food in a beautiful building with many ancient features. However, the guest accommodation has been most tastefully updated and the owners pride themselves on their attention to detail. If you're thinking of a romantic break, or considering whether to hold your wedding ceremony in the Lakes, this could be a perfect venue: the village church is just across the road from the pub, and the surrounding countryside is delightful. This is a quiet corner of the Lakes, but Bowness, Windermere, Ambleside, Coniston and Grasmere are all within easy reach - though you may not want to leave the village, because there are plenty of superb walks which start in Hawkshead village itself. This 19th century inn is built in traditional Lakeland stone and retains its period charm despite having been renovated to the highest standards of modern comfort. 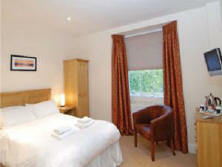 All rooms are en-suite and well equipped with modern facilities. The bars carry a fine selection of real ales from the Jennings range. The particular speciality of this house is live music in the The Coxwain's Cabin bar, every Friday and Saturday from March to December, with a late night licence. If you are fans of Jazz, Blues and Country and Western, as we are, don't miss it. Everyone loves Bowness, but sometimes the crowds in this popular little town leave one wishing for the peace and quiet of the Lakes countryside. And if that includes you, well, have we got an answer for you! We discovered the Brown Horse a few years ago, and it's been a favourite watering hole of ours ever since. The traditional English pub feel, with open fires and low beamed ceilings, great hospitality and fine ales, has been preserved even as the bedrooms have been beautifully refurbished with ensuite facilities. It was built in the mid 19th century although there is evidence that an earlier hostelry existed on the same site. As I mentioned above, the Brown Horse has recently been fully refurbished to a high standard without the changes encroaching on its period charm. The bar and restaurant still boast the original beamed ceilings while the log fires supplement the central heating. All rooms are tastefully furnished and fully equipped with the latest bathroom fittings. The relaxed public bar is noted for high quality, hand pumped real ales. The restaurant's menu of local and international cuisine with its extensive wine list offers an alternative to the bar lounge meals with a daily special. 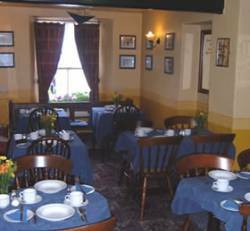 Both menus are well prepared and served and rely largely on fresh local produce. The great thing about the Brown Horse is that it combines the informality (and price!) of an inn or pub with the classy cuisine and superb setting of a more expensive (and perhaps pretentious) hotel. Highly recommended as a base to stay, but book early because they soon get filled up. This charming pub is a small family run Inn with a welcoming atmosphere, full of activity and life all year round. It's located in the heart of Bowness on Windermere, just a stone's throw from the Bowness bay piers, Windermere itself. The wonderful craft and gift shops of the town are only a few minutes' walk away. 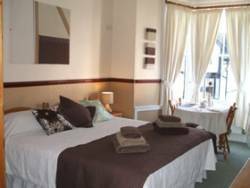 There are several bedrooms, many with en-suite facilities, all with central heating, tea and coffee making facilities and colour television. The rooms are all comfortable, traditional and homely. For that special occasion try one of the deluxe rooms with a king size bed and have breakfast served in your room! The owners will arrange flowers, champagne and any other special touches for your room. Ensuite rooms are from £27.50 per person per night, while standard rooms cost from £25.00 per person per night with full English breakfast included (and the breakfasts here are rather special!). 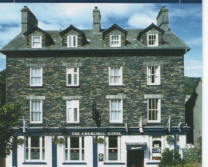 The Churchill Inn can be found at the centre of the charming Lakeland town of Ambleside in the midst of delightful shops, cafes and galleries. It is a perfect venue to enjoy walking the local fells, sailing on Windermere or just take in the atmosphere of Ambleside and the surrounding area. The accommodation comprises 16 double rooms, all recently refurbished to a high standard, many with magnificent views of Loughrigg Fell. The rooms are simple yet stylish, all with modern en-suite bathrooms, tea and coffee making facilities and LCD Television with multiple channels. Churchill's Grill offers a traditional menu with a variety of dishes to suit all tastes, using fresh, locally sourced produce whenever possible. You can start the day with a hearty full English breakfast, with locally sourced Cumberland sausages, bacon and eggs. Churchill's Main Bar and Monty's Bar have a wide range of beers, wines, spirits and speciality tea & coffee. Both bars offer award winning real ales from 3 local brewers. Free, private, off road parking is available to the rear. The Three Shires Inn, a charming Lakeland slate tavern, was built in the 19th century, in the Little Langdale valley, at the boundary of the old counties of Lancashire, Cumberland and Westmorland. The building has been tastefully transformed to provide modern en-suite accommodation while still maintaining the traditional style. The Walkers' Bar is traditionally furnished and has a log fire and a floor of Lakeland slate. As well as the local real ales, there is an interesting collection of fine old malts. The restaurant's wine list is extensive and reliable, and the menu is excellent, thanks to the personal service of the genial proprietor Mr Stevenson. One notable feature of the establishment is the hotel verandas which in summer are copiously bedecked with flowers and afford an exceptional view of the rugged scenery. The Inn is in Little Langdale, and it's best to see their website for details of how to get there. The Traveller's Rest Inn, a former stagecoach post, dating from the 16th century, has been tastefully transformed into a stylish yet comfortable pub, featuring modern accommodation without compromising the inn's original character. The pub bar features the original oak beams, inglenooks and an open log-burning fireplace. The beer garden affords a panoramic vista of the local surrounds. The outstanding feature of the pub is the quality of the food and drink. The restaurant boasts a comprehensive menu of local and international dishes, all of which are superbly presented. The wine list is extensive and well chosen, and there are some impressive real ales in the bar, along with a selection of fine old malts. 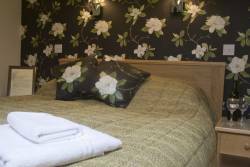 If you're touring around Grasmere, The Traveller's Rest is a great place to stay! On the road from Grasmere to Keswick, North of Grasmere. The Bridge Inn, a former stage coach post, has been tastefully transformed into a stylish yet comfortable pub, in the rugged surroundings of the western lakes. The pub fare is excellent and the Jennings ale is superbly maintained at its optimum condition. The accommodation is good and affordable and the whole ambiance is a credit to the genial hosts, Lesley and John, who offer a old-fashioned welcome in the tradition of Lakeland hospitality. Visitors travelling in November should not miss The Biggest Liar in the World competition which is hosted at the Bridge Inn. 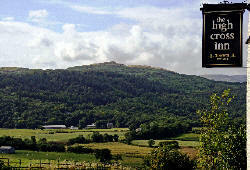 If you are visiting this forgotten part of the Lakes, then the Bridge Inn comes highly recommended. The lakes has so many traditional pubs dating from centuries ago that sometimes you feel spoilt for choice. But the King George The Fourth is special even by the Lakes' standards. It sits in the heart of one of the most beautiful villages in the Lakes, and it offers very up to date and comfortable accommodation in the ancient building. What's more, the comfort and convenience of the en-suite rooms is backed up by superb food and real ales presented in different styles to suit the occasion. From a formal dinner to a quick bar meal, the King George offers all the dining options you could need. And it's a perfect base for exploring this more remote and less well-known part of the Lakes. And no description of the King George would be complete without a mention of the 200 malt whiskies it offers. Talk about enthusiasm for your subject! How would we sum up the King George? In short, a real ale pub with food and rooms of hotel standards, offering bed and breakfast at guest house prices in the finest part of England's Lake District! This 18th century coaching inn offers stupendous view of the Ullswater and surrounding fells, but the crowning glory of this AA 3-Star Inn is its food, food that belies the nature of a traditional walker's inn. A comprehensive menu offers an array of locally sourced, seasonal dishes cooked fresh on the premises under the guidance of chef patron, Shaun Dixon. If you want to give your taste buds a treat, this is the place for you. On our first visit, we had planned to stay for a day but extended our stay for another three days on account of the quality of the menu. A selection of well-chosen wines, which can be served by the glass, six real Cumbrian ales which include Tirrel, Dent, Coniston, Corby and their own Brackenrigg draft, all contribute to Brackenrigg Inn’s hostelry image. Its old worldly charm and individual character is emphasised in each of its 17 bedrooms, all of which are en suite, some with Lake views. The fact pets are welcome in some rooms is a real bonus. Another thing we appreciate about the Brackenrigg is that we can work off all that sumptuous food with a spot of activity next day - right on the doorstep. There's all the North Lakes mountains close at hand, of course, and you can read more about them on the walks page, but in addition the hotel's website lists about 12 different activities you can enjoy nearby. They'll help you arrange horse riding, fishing, cycling, quad biking, canoeing, and much more, and they even have a secure cycle store if you're on a cycling tour. And the great thing about all this is that they are so willing to help; there's a real sense of hospitality and friendliness about this pub which is so welcoming we've been there four times now. Overall, a good place to stay if you can take the chance that you won't be trapped there forever by the quality of the food! Featured in AA 'Pick of the Pubs since 2005! 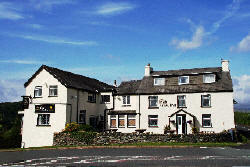 The Brackenrigg Inn, Watermillock, Ullswater CA11 0LP (1 mile south of Pooley Bridge on the A592). 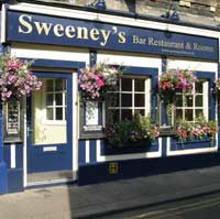 Sweeney's Bar, a subtle combination of bar, restaurant and hotel, can be found in the heart of Keswick town, the perfect base for touring the northern lakes. The accommodation is stylish and modern, bordering on the opulent, but without the lavish vulgarity associated with modern "American style" hotels. This is modern design at its very best. The bar and restaurant have an extensive quality wine list complemented by a selection of real ales and continental beverages. The restaurant's a la carte menu of local and international cuisine features daily specials created by the experienced chef. Free parking is offered to all residents. Overall, we think Sweeney's provides the perfect pied-a-terre for touring the Lakes! This country pub was built in the 19th century in the traditional style of the South Lakes. It has recently been refurbished to a high standard, without encroaching on its period charm. The bar is comfortable and friendly and provides excellent real ales and pub fare to a high standard, produced from fresh local produce. You can relax in the bar or beer garden at the foot of some of the Lakes' most spectacular scenery before having a splendid dinner of locally produced food (the local meat comes especially recommended) and retiring to a comfortable bedroom. A lovely little place.